Plot Outline: Professor Trevor Anderson receives his teenager nephew Sean Anderson. He will spend ten days with his uncle while his mother, Elizabeth, prepares to move to Canada. She gives a box to Trevor that belonged to his missing brother, Max, and Trevor finds a book with references to the last journey of his brother. He decides to follow the steps of Max with Sean and they travel to Iceland, where they meet the guide Hannah Ásgeirsson. While climbing a mountain, there is a thunderstorm and they protect themselves in a cave. However, a lightening collapses the entrance and the trio is trapped in the cave. 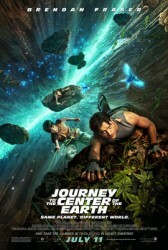 They seek an exit and falls in a hole, discovering a lost world in the center of the Earth.